This is the first of what hopefully becomes a number of posts looking at trying to squeeze a game using larger scale figures into a small gaming space. For around a year, this blog has followed the evolution of getting a 10mm figure game into an area the size of a large pinboard (34" x 22") and while that continues, I still want to scratch that itch for being able to enjoy the sheer aesthetic of a larger scale - even though the game area is going to be limited to what might best be described as a kitchen table gaming. These posts will just be a gentle ramble of my dipping a toe into that world and seeing if I can get it to work for me. Please click on 'Read More' for the rest of this post. I am guessing that I am not alone in the emotional side of me wanting to dabble in a larger scale but the 'Captain Sensible' part of me knowing that I really don't have either the playing space or storage space for that to be practical or perhaps even possible. Despite that, I seem to continually go through that cycle of 'want' and 'dismiss' in my head. If you recognise that sentiment, then I hope you can enjoy and indulge a series of occasional posts that explores the situation a little further, perhaps just for the sake of itself, in full acceptance that all of this might actually come to nothing....... but hopefully that journey will at least be pretty! Basic thought processes at this time - I already know some gaming is possible, with an emphasis on skirmish and DBA / Basic Impetus style games, but for this scale to work for me, getting some larger formations (such as napoleonic battalions or brigades) and figure numbers onto the table is important. While that can probably be done in terms of physical placement, the question will be whether the game feels like there is sufficient manoeuvre room with perhaps 6 - 10 units per side. The table size is just 42" x 35' and could probably be expanded out to a 4' x 3' area (48" x 36") by placing two 2' x 3' boards on the table. I like WWII tactical games and will want tanks on the table, so it seems sensible to use 1/72 scale for this era rather than 28mm (about 1/56). 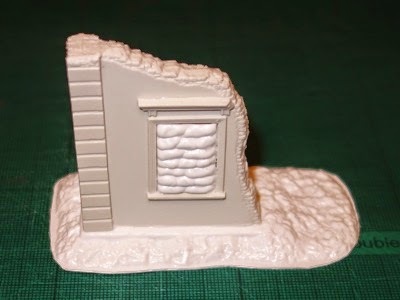 Therefore my initial terrain will match 1/72, but this might actually also be a good scale of terrain to use with 28mm that I would like to use for other periods, as anything that keeps down building footprint is going to help and I know a lot of gamers use buildings that are 1 scale lower than the actual figures they use. I quite like the idea of scenic bases representing an entire formation as in Dux Bellorum (which I have on my Kindle) and Impetus, but I would also need to see napoleonic units use line, column and square. I like 'Line' figures based quite closely together and done in two ranks for that sense of mass, even though the figures might look a bit too 'cosy'. The tug of war going on in my mind is that although there is a general view that the smaller scales give a sense of mass (due to head count), I actually feel like tightly packed larger figures actually gives the greater sense of mass (due to 'real' physical mass). However, my limitations on both gaming and storage space are very real. Overall, the small size of the table should naturally limit army size and terrain needs, with both those things helping reduce painting and storage pressures, but will it give a good game? Starting off - This all happened after seeing a recent video AAR by 'War Panda' on a forum (link in the resources at the foot of this page). I had already been enjoying some posts about the larger scale, for example from Piers with his Battleground stuff, but the War Panda video finally gave me the nudge. I visited a well stocked model shop, which had a lot of N Gauge stock that I perhaps should have bought to support my 10mm collection ....... but with oodles of 1/72nd and 28mm stuff winking at me, the will-power finally broke. After going back and forth between the N Gauge (for my 10mm) and 1/72 (and 28mm) aisles in the shop, picking stuff up and putting it down, contemplating what to do, I decided to take the plunge - or rather dip my toe into the waters of the larger scale. I took my small gathering of 1/72 nd goodies to the till and paid the nice man. Only four items were purchased for this initial baptism of fire. 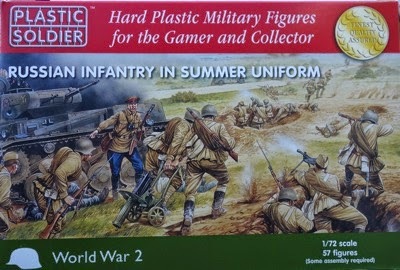 A box of 1/72 Russian infantry from Plastic Soldier Company (£11). 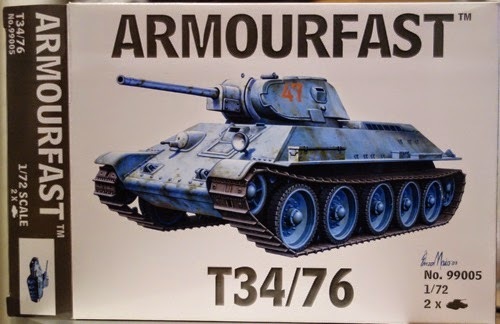 A box of 2 x T34/76 models from Armourfast (£8). 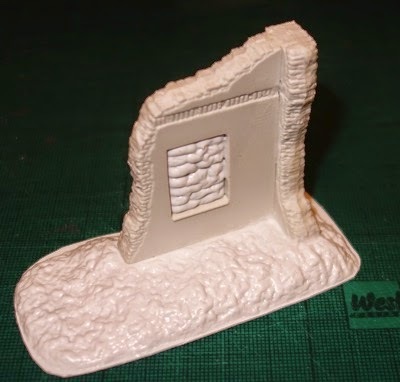 A boxed kit for putting together a small section of ruined building from MiniArt (£6.75) and finally just a 6" length of wooden fencing in a very dark brown with a flocked base (£1.50) - I think these may have been made by Jarvis. The idea being that these items taken together might just give me enough of an early feel to see how this might look on the small table (total cost £27.25). Even as I was getting back into the car to return home, there were still doubts. I didn't really want to invest time in pursuing something that might lead to a dead end and be a major diversion from the already too numerous current projects on the go and so though the seeds of a project had been sown, enthusiasm was tainted with substantial caution. Cracking on - First up, the easy bits, the fence and building sections. The fence is very nicely textured, though dark overall. This just required a very quick light dry brushing with a light brown - job done, it actually looks more natural, tonally, than my photo suggests. Indeed all the photo's here look a lot less natural than the eye sees them under normal lighting conditions (boo-hiss to digital, camera flash and white balance!) . 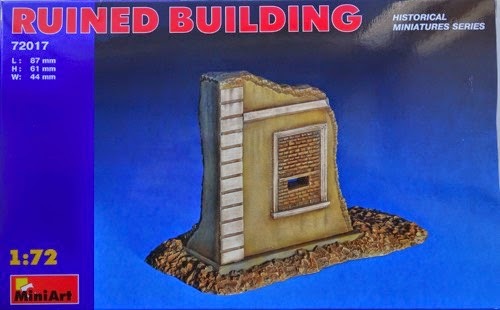 The building section is a plastic kit that comes with a raised base decorated with rubble texture. Everything is in white plastic. There are two options for the window. ONE the window is bricked up with a gun slit built into it as per the picture on the front of the box. TWO, the window is sandbagged, which is the version that I chose to make. It's not particularly great value for £6.75 but it will eventually have its place on the table and is useful because of the small footprint. Once everything was glued up, there were some gaps and these were filled in with Galeria Modelling Paste (art product), which is a very light and loose wet paste that is ideal for these sort of jobs. The model was undercoated with Vallejo black primer and then dry bushed in a sandstone colour to bring out highlights and help the vibrancy of the following layers. A couple of metal washers were glued (hot glue gun) under the base just to give a bit of heft. Acrylic paint with a bit of retarder (to give time for some blending) was used to complete the building, with some extra brick coloured rubble added to the base. 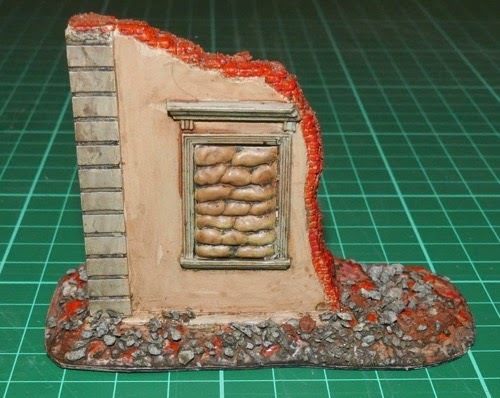 The red brick rubble is a nice colour / texture and I ordered it from a fellow blogger, see his e-bay link under 'resources' at the foot of this post. I have not decided yet whether to keep this ruin as free standing or whether to build it into a larger scenic base - probably the latter, to better 'knit' it into the landscape. I need to 'rough it up' a bit more. The T34/76 tank - Armourfast do two vehicles to a box. They are plastic kits with few parts, designed for fast assembly. 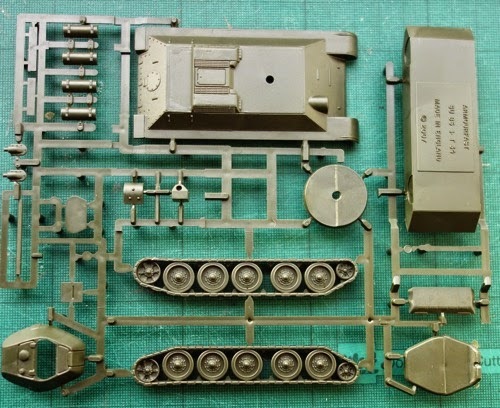 So I was relieved to see that the track and wheels were on the sprue as single units, though on a downside, decals are not supplied and the level of detail in some areas is less than I have seen in other models. This is most noticeable on the track treads - though they are not that visible on a wargame table. It is in any case a cost effective way of getting vehicles quickly onto our table. Few parts - and ready built tracks ...... joy! To give the plastic model a bit of heft, I hot glued two medium sized metal nuts into the lower body. Wilko's (a store in the UK) let you fill up a large 'pick 'n mix' bag of washers, nuts and bolts for £2.99 (or a smaller bag for £1.99) - that is a lot of metal for its money. Once the pieces were cut from the frame, the kit took around half an hour to build, though I had to re-drill the block that takes the gun. Before priming, a few bits were added to further dress the body. An additional tool box, (just a piece of wood) a wooden pole (a cocktail stick with heavy cotton ties added as strapping) and a length of steel wire for a tow cable (some thin wire with the plastic sleeve stripped off) were added to 'dress' the vehicle. on the other side of the vehicle. The body took the black primer well, followed by a dry brush of sandstone to get a light surface to work on and then a coat of Vallejo Russian Green. Mud was added to the wheels and then some further dry brushing gave a worn and weathered look. Thinned Army Painter Dark Tone ink completed the job. I think for a £4 model it does pretty well. The decals came from the Plastic Soldier Company. 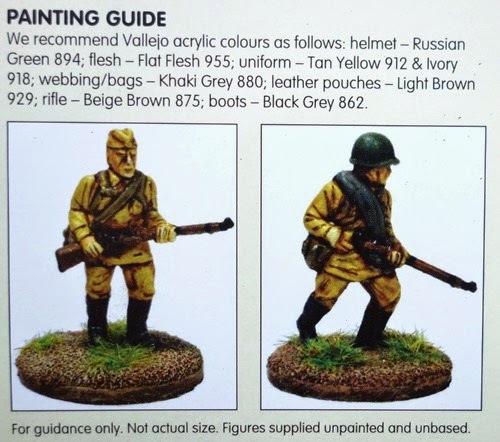 The Russian Soldier - I have the Bolt Action rules on my Kindle which require the figures to be based as singles and Neil Thomas' rules called 1 Hour wargames, which use bases to represent a platoon. I like the look of the new PBI rules by Peter Pig (because I like grids) and they have figures paired on a base and I also like my own rules (hex based with 10mm figures - which can be converted to non-hex if necessary) in which a base has several figures to represent the entire rifle section, including the section LMG. So at this point in time, I am not fully certain how best mount the figures. Rear of the PSC Russian Infantry box. There is some preparation needed, such as a few heads, arms, weapons needing to be glued to the bodies, but there is not too much of this to do. The figures were black primed, sandstone dry brushed to find the detail and help keep colours more vibrant and then block painted. Army Painter Soft Tone ink works well with the Russian uniform to unify the figure. After which they were matt varnished. They are nice figures to work with and I have enjoyed the modelling aspect of the scale. With my 10mm, once painted, satin varnish goes on first, then ink and then mat varnish, taking 24 hours drying time before each stage. I wanted to cut out a process step, so for my first batch, the satin varnish coat was dropped. Using Army painter soft tone ink mixed with some water (2 water to 3 ink) and applied liberally, using a brush to move the ink into the recesses, the figure did darken but not too badly. To get some highlights back, original colour was applied back onto the figure in a rough and quick sort of way, just catching large areas like shoulders one forearms etc. EDIT - Since writing the above, I have painted and based my first batch of figures. I have never liked painting, but actually quite liked doing the bigger figures. The figures have been based as singles except for the LMG team. In the meantime, I will run a few practice games with various rules using card blanks for bases, just to see whether this is a project that I want to continue. In an effort to get some 1/72 sized terrain onto the table quickly (supplementing the stuff used for 10mm), to properly assess the impact of the scale on the small table, some additional items have been sourced. I put the below field together over the course of a short evening. Parts used - two lengths of hedge, piece of door mat, two lengths of Balsa wood for the base - braced with tongue suppresser sticks and lolly ice sticks, filler paste to do the edge and hide the rubber back of the mat and then some paint and flock. My able assistant was the hot glue gun. The result is actually rather nice. The door mat was bought at Wilko's (UK). It was cheap at £5, but the cheapness translates into a thinner backing, making it easier to cut and work with. 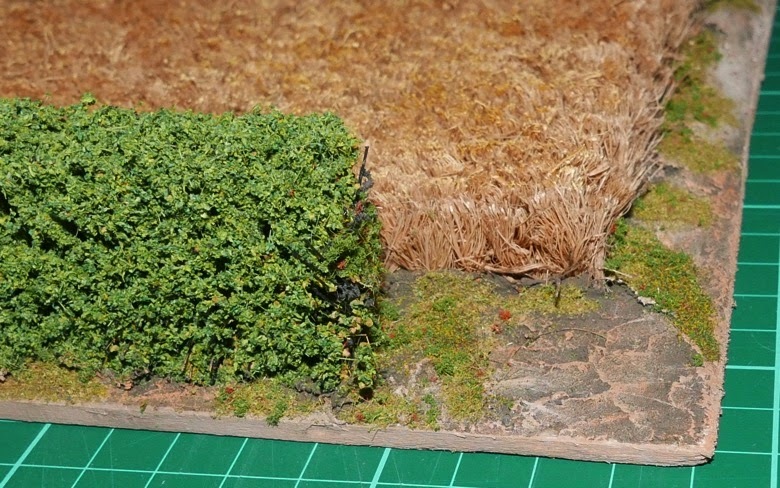 Also the mat was totally plain (no print) so all of it can be used, making it a good find for the wargamer. Note the two lengths of hedge around the top and right side of the field - difficult to see in this photo. 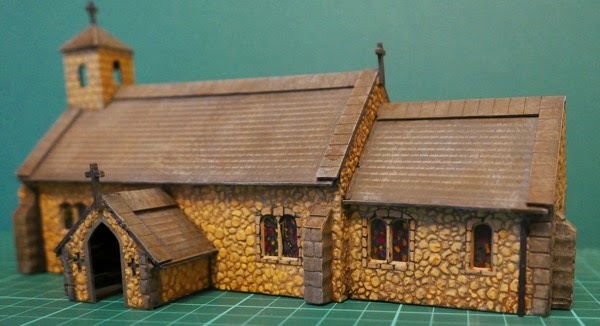 Next up I bought a 1/72 church kit from the model shop (by Dapol). It was surprisingly cheap (around £6.50 I think), but it comes with a warning that the kits are made from an old process and that some parts may be be slightly out of shape. My main back and front wall were slightly twisted, but easily corrected. The good thing is that the building actual feels a bit under-scale compared to other buildings I have seen, but that helps with our space limitations. (Edit - some have identified this as an 'old' Airfix model). The camera flash is bringing out the brown cast of the ink - but to the naked eye, this is not present! Under the church I have hot glued five wooden blocks (mis-shapes from Commands and Colors games) ready to act as feet to glue the church to a base, instead of having glue ooze out from under the building walls themselves. I have since bought a few more items, including, some German infantry, two Armourfast StuG's and several buildings kits from the rail model shop - including a windmill, which hopefully should make a nice generic piece for several periods (though perhaps not for my east front games - Doh!). My scenic kit has been updated to give a better modelling effect and some deeper boxes obtained for more effective storage. At this point in time, I am probably even more torn than before as to the practicalities of scale and in particular storage. Working with the larger scale has been really enjoyable and visually is very appealing, but already the practicalities of storage are staring me in the face and it just remains to be seen how this pans out. In some respects, scale and storage space can be rationalised. A tree remains a tree and so my older trees can still be used, with a splash of some new bigger trees that will just need to upgrade the storage box to something that is an inch or two deeper than the current one. The church, while being three (or more) times bigger than a 10mm church, in some case might mean that it simply takes up the same space that additional 10mm buildings might have taken. So in 10mm there may be 8 buildings on the table, but in 1/72 or 28mm, the same space would be taken up by 3 buildings - will that matter ...... maybe, but not always. It may lead me to having to choose between collecting and storing 10mm or 1/72 (and 28mm) rather than both as a common terrain scale to the various periods might possibly be integral to the viability of the project. Collecting armies will have some similar constraints. The bigger scale will probably give bigger but fewer bases overall, though still an overall growth in storage space. My figure draws themselves are deep enough to take bigger figures, it is only the footprint that will actually matter. In some regards space differences cannot be rationalised, with tanks being an obvious consideration. Three 10mm tanks easily fit in a Kallistra hex, even with some other terrain. At 1/72, the hex can only accommodate 1 tank and this game table problem is transferred directly into a storage problem. Having maybe say 16 tanks in storage for an army is a very different prospect when 1/72 is chosen over 10mm - foot print is a real dilemma. 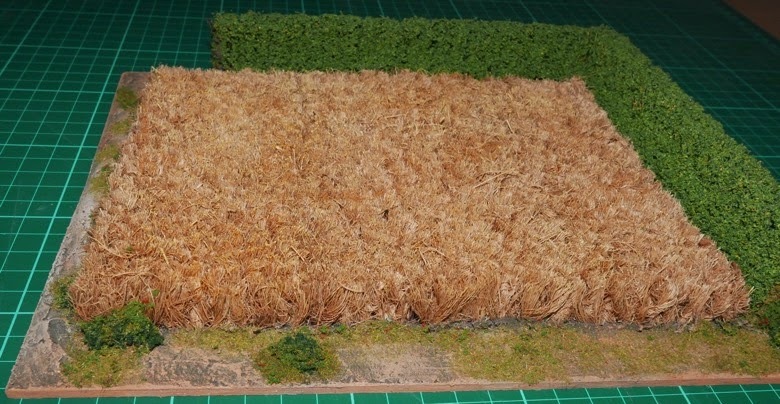 The whole purpose of this blog is to look at wargaming in small spaces. If I cannot get the sort of game that I want in 1/72 or 28mm into a 4' x 3' space or smaller, then space constraint will not justify it being in my home or on this blog, so I will be pushing the envelope to try and get something viable up and running. As an aside, regular readers will note that part of reason for gaming off a small board is that back pain prevents bending over or across a table. To make the 4' x 3' area work for me, I placed 4 storage boxes onto the kitchen table and then 2 sheets of 2' x 3' on top of them. This gave a substantially raised 4' x 3' game area by a foot or so, reducing the need for leaning across the table - though it does require more standing. I mention this only for those in a similar position. Regardless, as this develops, I will post further as the experience unfolds. I have been enjoying the involvement with this new area and that's the main thing. Thank you kindly. Your videos have helped a great deal. I would never have considered skirmish WWII with just a couple of vehicles on the table. I have been doing entire squads per base in 10mm and typically putting 3 to 6 vehicles out per side. So I was really surprised how much I was taken by the Bolt Action stuff, I like the narrative game it produces. Importantly, I also like to look at and handle the larger figure. Whether this is a nostalgic return to my youth of cracking open a box of figures attached to a sprue - or whether older eyes just appreciate the aesthetic of the bigger figure more (or perhaps both reasons), either way I have had a real buzz this past week, working on this stuff. The limited playing / storage space puts an interesting spin on the functionality of the large scale, and I love the way these sort of posts generate links and comments from fellow gamers and their experiences of gaming in similar circumstances. Linking the post to your video is fine, if it gets anyone to have a 'dabble', then all is worthwhile. Cheers Norm. Don't have doubts Norm! Although I think after spending so much on it, you will had to ignore the doubts! 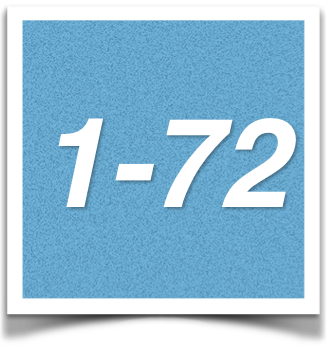 WW2 1/72 is fantastic. But then, I am biased so feel free to ignore me. I have a 3'x5' fold out antique table. I actually searched for about 7 years for in in the 90's (I also planned to use it to play boardgames as it is a very good size for a 34"x22" maps + play aids,, but have not done so). It has two wings that are both 3'x2' so it is only a 3'x1' table when it is put away. it looks just like a small side table, which is what it is used for at the moment. In the early 2000's I mostly used the 3'x5' table to play WW2 1/72 games, either solo or against friends. The rules I used were IABSM, Take Cover (equivalent to Rapid Fire) and Combined Arms (once!). I think Bolt Action may be fine as well - looking forward to seeing how they go. You will notice the same wheatfields you have! 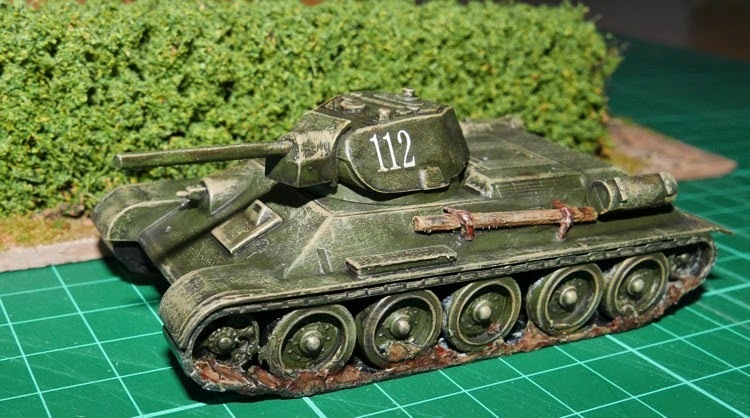 I do like the idea of adding weight to plastic tanks, I have never seen this before and may have to do it as I am working up the courage to buy some PSC early Russian armour. In short, I am looking forward to how your project goes! Hi Shaun, thanks for commenting, always interesting to see how gamers go about their hobby. One of my complaints about wargame magazines is that the consistently show super tables with super figures, with a near virtual absence of the 'more honest' reality of how we game in our homes - yet is is seeing how people do that, which is the more interesting. 3' x 5' is pretty much a standard UK dining table space these days, so much so that several of the rule sets from Peter Pig use that as the standard scenario layout. I have noticed over the last 2 years that UK shows have an increased proportion of smaller game tables on show. my 10mm is VERY practical, especially building and tank size - but, things like a HMG in 10mm don't really have the attractive appearance or are readily identifiable as they are in the larger scale. 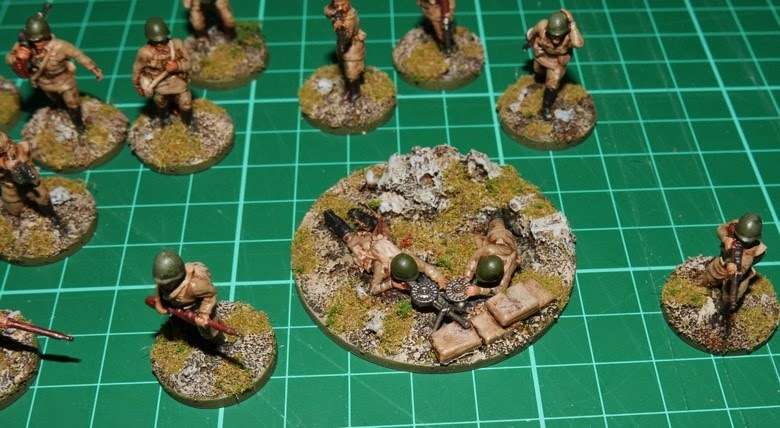 I sort of identify them by the fact that they are on a small square base (rather than the oblongs that everything else uses) and it is that sort of thing that draws me to 1/72 - though I know the 10mm ultimately works better with my hexes. I have just bought some hex blanks to try a stab at making some nicer boards - again something spurred on by Panda's video. I won't make boards like his table, but at least it is pushing me to enhance the visual aspect. good to hear your thoughts Norm. The nuts and washers are a great idea, gonna steal that one!